The Yahoo! Travel site once describe Slovenia as the darling of Yugoslavia that got away. Slovenia was the first country to declare independence from Yugoslavia after the Cold War, and was fortunate only to have fought a ten-day limited conflict, as opposed to the horrendous war that engulfed the rest of the Balkans. Slovenia wasted no time exercising its old ties to the West and positioning itself for inclusion into the European Union in 2004. What old ties? Slovenia’s capital, Ljubljana (loob-lee-YAN-uh), was the former French capital of Napoleon’s Illyrian provinces (a memorial to Napoleon resides downtown). Later, Slovenia was brought into the Austro-Hungarian Empire, where it prospered. Now, Slovenia has every modern convenience available and is attracting tourists seeking refuge from the high prices of the Austrian Alps to the north by offering the southern Julian Alps. Slovenia’s small stretch of coastland (with Koper and Piran) is also attracting lots of visitors. My only trip there took place on a cold November weekend in 2001 when I hope to witness Slovenia facing Romania in the first of a two-leg playoff with a World Cup bit on the line. Indeed, I succeeded and it was a terrific opportunity to witness a major milestone in this young country’s history. I spent most of the time in Ljubljana, but also made it out to the famous lake town of Bled (who celebrated its 1000th anniversary just a couple years later). My “list” for Slovenia contains Koper and Piran on the coastline, the city of Maribor in the northeast which is only a short train ride from the Austrian city of Graz, and the Skocjan Caves which are somewhere between Koper and Ljubljana. 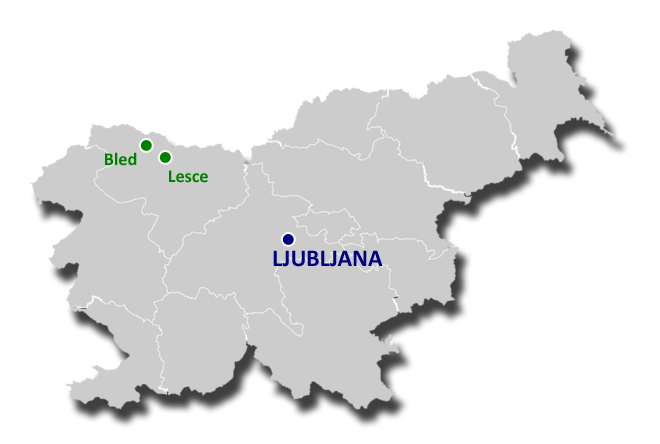 The coloring of the locations on the map above indicate different locations in Slovenia, as shown below. Ljubljana is a jewel that deserves a lot more attention than it gets. It is a beautiful city wrapped around a sharp bend in the river with the grand white Ljubljanica Hrad (castle) looming high overhead. It has a long history, 3000 years ago it was the Roman city of Emona, and large sections of the Roman wall still remains. But Ljubljana is very much a modern city with new cafes and restaurants and all the modern conveniences. It’s a great, and relatively untapped, place to visit. The Julian Alps south of Austria are being touted as an inexpensive alternative for European snowbunnies. Among the foothills of these Alps is the town of Bled, famous for its huge Alpine lake (pictured) with a single island and Cathedral in the center, and the tall cliffside that hosts the 1000-year old Bled Castle. This resort town is being quickly rediscovered by tourists. As an aside, I also included the small village of Lesce nearby, as it provides a brief insight to how Yugoslav towns appeared during the Communist era.